A car and motorcycle collided Wednesday night, sending two persons to Salina Regional Health Center (SRHC). 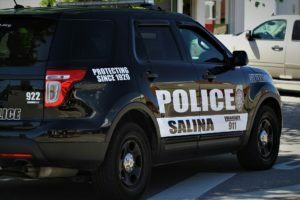 Salina Police Captain Paul Forrester told Salina Post that a 16-year-old driving a 1992 Buick Le Sabre was headed north in the 2100 block of South Ohio. When she attempted to turn left onto Belmont at 10:10 p.m. Wednesday, she failed to yield to a southbound 2000 Honda Motorcycle with two people on board. The motorcycle ran into the passenger side of the car, and a 61-year-old man and 59-year-old woman were thrown from the motorcycle. According to Forrester, both the motorcycle driver and passenger were transported to SRHC with minor injuries. Neither was wearing a helmet, he added. The teenage car driver was not injured, according to Forrester. She was cited with failure to yield when turning in an intersection. The car received minor damage on the passenger side. The motorcycle had major damage and was towed, Forrester added.